Limit of like four, per purchase, transaction. All the words can get confusing. Learn how to understand the stuff on a coupon below. Plus if you shop at BJ’s you’ll be on your way to mega savings. When I first started really couponing I had some embarrassing moments. Why? Because I am hyper and grab and go and sometimes forget to read that fine print on a coupon. There are a few key things you need to know when starting to really coupon. I’m talking when you stack coupons and get the best deal not just “oh there’s a coupon to save $0.50 on my favorite bar soap, I’ll bring that along at the store today!” No no no.. When you want to save mad money on items you plan. You use your coupons on SALE items only! Sale items at BJ’s are when we have a clipless or BJs coupon to stack! There are store coupons and there are manufacturer coupons. Most coupons will state which type they are at the top of the coupon. If it is a manufacturer coupon it will include a remit to address in the fine print. Store coupons will not have this listed as they do not need to send the coupon off for reimbursement. Per Transaction. A transaction is everything you are purchasing during your shopping trip. Once you hand over your cash or swipe your card that is a transaction. So if coupon states ” Limit one per transaction” that means you can only use that one coupon for that transaction. You can do a separate transaction and use another of the same coupon. Example: If you have 3 items and 3 coupons that state per transaction you need to do 3 separate transactions. You will pay 3 different times! Per Purchase. An item you buy is a purchase. If you buy 5 boxes of Fiber One Bars you have 5 purchases. If your coupon has a limit of 1 per purchase, you can use one coupon for each item. Per Visit. This is a bit rarer but if the coupon has this wording than you can only redeem it each time you visit that establishment. This gets tricky and really depends on the store policy because some would argue that they would leave the store and then come back in. I say if you really need the item go another day. Per Customer. You are the customer. A friend, spouse, whoever is another customer. If your coupon has this wording each person can run a transaction and use the coupon. Each customer is limited to using just one coupon. I am going to add in this section the LIMIT OF …. This means that there is a limit of how many like coupons you can use. For example, the $1/1 Dole coupon states a limit of 4 like coupons. That means you can not buy 5 Dole Smoothies and use 5 of the $1/1 coupons. You could use 4 $1/1 Dole Smoothies coupons and 1 $0.50/1 Dole Smoothie instead because the value is different these two coupons are not alike. Buy One Get One FREE coupons! Love these. When you buy one of the specified items you get the other item specified FREE! The thing to pay attention to with these coupons is the item you can get for free’s VALUE. On this coupon is says $3.10. That means if the Craisins at your local grocery store is $3.50 you will have to pay the $0.40 difference. BOGO coupons at BJ’s means you will receive the maxium value off your product. Pay NO attention to my terrible cut job! That’s just to show ya a Momma has to clip fast with young kids! See that Available at Walmart picture? I do not like these. But that picture is just suggesting you use it at that store. This is indeed a manufacturer coupon. ( you can tell by looking at the top) Be sure to check your store’s coupon policy first before using a coupon with a logo on it. CVS, for example, will not take a coupon with another stores logo on it. Tops in Batavia will take these. Although some cashiers have raised questions but the manager has always approved! 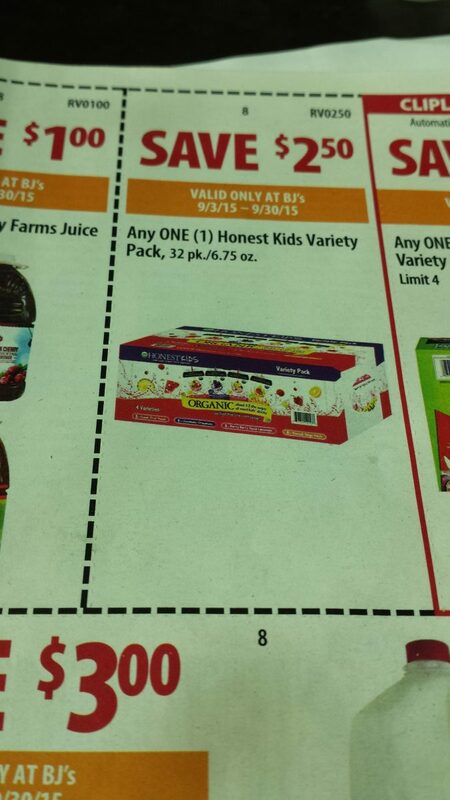 Also never judge a coupon just by the picture of the item shown. For example on the coupon above the tea shown is Sleepytime. This coupon can be used on ANY celestial tea, not just Sleepy Time. So be sure you read your coupons wording and not just look at the picture. Some cashiers are guilty of just looking at the picture so be prepared to know what your coupon says! Just about all coupons have an expiration date. The coupon can be redeemed through midnight on the date the coupon expires. Cashiers will carefully review your coupons to ensure they are not expired, so always double check your dates! The reason for these expiration dates are to help the manufacturers record what offers are working and which are not. Some coupons have this in the fine print. This means it’s pretty much up to the store if they want to double these or not. If the coupon’s numbers at the bottom start with a 5 and it says DND on it many local grocery stores will still double the coupon. Check your store’s coupon policy on doubling. BJ’s club DOES NOT DOUBLE ANY COUPONS TO BEGIN WITH! So if you are strictly a BJs shopper you don’t have to worry about this! When a coupon is worth $0.50 it would be worth a $1 if your store doubles. The store will cover the additional savings. Some coupons have this wording to protect the stores. If they offer doubles or triples this can a great additional expense to the store. This gives the store the right to not have to double or triple them all. But many stores ignore the wording! What tips do you have for understanding and using coupons? ?